Another CSUN conference has come and gone. This year was the 30th Annual International Technology and Persons with Disabilities Conference (Twitter hash tag #CSUN15) held in downtown San Diego, California from March 2 to March 7, 2015 at the Manchester Grand Hyatt Hotel. Below is a podcast with three interviews; some resources on recommended sessions; info on fun special events and activities; two award events; a short Best Of list; about a conference theme; and next year’s dates plus links to conference tips. I had the opportunity to speak to a few folks while attending; check it out! Cognitive Accessibility 101 by Jamie and Lion at CSUN15, a review by my author @DennisL. I want to give a shout-out to three Tweeps I’ve known online for a while now and finally met in-person: Mike Gifford (@mgifford), Adrian Roselli (@aardrian) and Jason Kiss (@jkiss). The 30th Anniversary Party featured keynote speaker Mick Ebeling (@mickteg) of Not Impossible Now (@notImposs). It was very interesting and moving—a great keynote. Geri Jewell, one of the past Keynote Speakers, served as the program’s emcee and introduced performances by comedian Chris Fonseca (who was hilarious!) and musician and humorist, Mark Goffeney. Once again, happy CSUN birthdays to @Jennison and @MarcySutton. The birthday celebrations sure brought a lot of income to The Cheesecake Factory across from the hotel! There were a couple sky-diving outings planned and executed, wow! There was a tandem bike event organized by @MarcySutton, @Nethermind and sponsored by @SimplyAccesses. The good folks at @Knowbility held an event to announce and present awards to the Community Heroes of Accessibility. Also, here’s a cool tote bag I picked up at the Knowbility exhibit booth. Project Possibility (@ProjPossibility) held the SS12 Finals on Saturday morning. Congrats to the winner USC‘s “Stealth Fly” team who edged out CSU Northridge. The team presented a competitive vertical-scroller game to three judges. Most popular session: Jamie Knight (@JamieKnight) “Cognitive Accessibility 101”. So much in demand that it was actually repeated the next day! Best Dressed: Sam Ogami of HP. He is one nice, classy fellow! Best slide: Dude, where’s my ARIA? A theme which became obvious throughout the conference is this: embed accessibility into the development process—everyone is responsible. This topic was mentioned in numerous sessions, and with good reason. Teams must work together; from execs to content owners, to designers, to developers, to quality engineers. Recently I attended Open Web Camp 6 (@OpenWebCamp) at the beautiful PayPal headquarters in sunny San Jose, California. Like every year, the event is coordinated by @JohnFoliot. If you want to review the Twitter feed, the hash tag is #OWC6. Like last year, the cost of the event was only $10, and attendees get a nice lunch, a t-shirt, and some other swag. The networking was good and the energy was great! 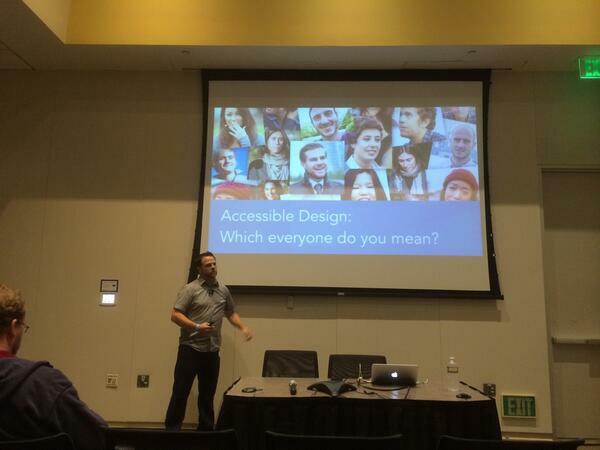 Derek Featherstone (@feather) presented Accessible Design: Which “everyone” do you mean? where he discussed accessibility challenges for users of assistive technology such as voice recognition and screen magnifiers. Dylan Wilbanks (@dylanw) presented a thought-provoking session Meditations on making fire-proof, failure-proof, future-proof things. Dirk @Ginader presented Teach your Browser new tricks where he discusses longdesc and browser extensions. @KarlGroves spoke about accessibility testing and his app Tenon. The Twitter talk “Connecting to the pulse of the planet” was disappointing. It was much more of a 25-minute sales pitch than a tech talk. All in all, it was another successful web event. Hoping for an OWC7! Factoid: I’ve attended every OWC event since its inception at the first Open Web Camp at Stanford, and spoke about the then newly created @EasyChirp (then called Accessible Twitter). Another CSUN conference has come and gone, and they only get better each year. Of course I’m referring to the CSUN (California State University, Northridge) Annual International Technology and Persons with Disabilities Conference which happens at the incredible Manchester Grand Hyatt Hotel in downtown San Diego, California. The conference was officially kicked off Tuesday evening with a keynote speech by Tommy Edison (starts at 9:45) who is also well known as the @BlindFilmCritic. 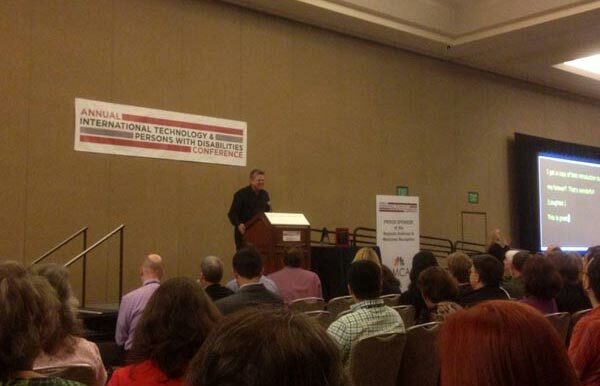 Tommy Edison, standing at the podium, presents the keynote address at CSUN14. There was a lot of talk (and behind the scenes) about the International Association of Accessibility Professionals (IAAP). Two hack-a-tons occurred which was great! A TPG Bug Bash and an ARIA Hackathon by organized by @JohnFoliot. I attended the Project Possibility’s SS12 Finals where the “Code for a Cause” contest is concluded. The contest is among university teams for the best accessible application. The winner was the CSUN team for a camera app for the blind. Stevie Wonder was in da house! Check out this news feature, Stevie Wonder Touts Technology for Impaired (NBC San Diego). And check out Billy Gregory’s selfie with the music legend! Next year is the 30th CSUN and promises to be even bigger and better than ever. Seriously, there are tremendous plans for CSUN15 are already under way. Hope to see you there! It was another great year for Web Axe and its creator Dennis Lembree. Early in 2012, we published the Podcast 94: Women of CSUN12 featuring six female presenters (one of my favorite podcasts); then a quick review of the conference. May was the month of Global Accessibility Awareness Day (GAAD). Here’s the GAAD podcast and Reflecting on GAAD by guest author Jennison. To address the most bothersome trend of the year, we wrote Placeholder Attribute Is Not A Label! Mid-year, Dennis was fortunate enough to attend Google IO12; here’s the blog, Google IO12 Review and Accessibility. In September, we published a extensive book review on Pro HTML5 Accessibility. Then, Dennis presented How To Build An Accessible Web Application virtually at the Boston Accessibility (Un)Conference. In October, a huge change came to the New Web Axe Website! We moved from Blogger to WordPress. The RSS feed has also changed. Please update your links. In November came Accessibility Camp LA and a podcast featuring great improvements in WordPress accessibility. Looking forward to another big year in 2013!